It's time to put avocados back on the grocery list. Long-deemed "too fatty," this green fruit is actually a goldmine of nutrients that affect brain health. According to a review published in "Nature Reviews Neuroscience" in July 2008, the right nutrients can improve cognitive function, such as memory and concentration. Certain nutrients may also reduce the risk of stroke, which can occur when a clot forms in a blood vessel and blocks blood flow to the brain. Avocados are rich in these nutrients, making them "brain food." Not bad for guacamole! 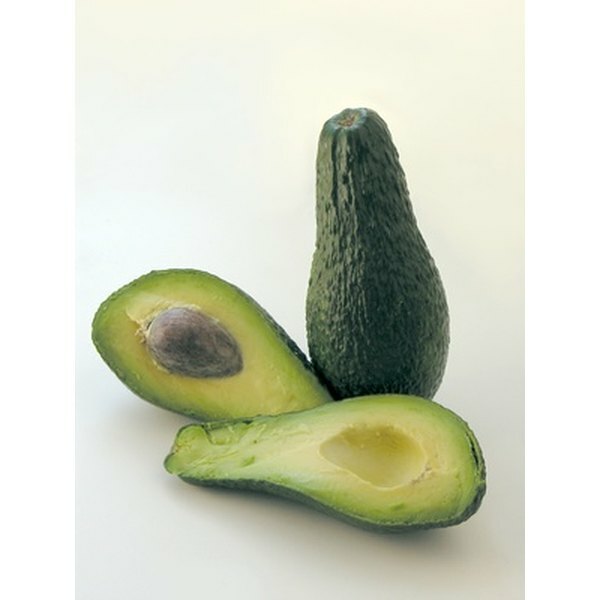 Avocados are rich in monounsaturated fat, which is considered healthy fat. Monounsaturated fats decrease LDL cholesterol, the bad cholesterol, while increasing HDL cholesterol, the good cholesterol, thus preventing hardening of blood vessels. Healthy blood vessels allow proper blood flow, which reduces the risk of stroke. Half an avocado contains 10 g of fat, 7 of which are monounsaturated. Proper blood pressure depends on regulation of potassium concentrations both inside and outside of cells. Avocados lower blood pressure, according to Steven Pratt, author of "SuperFoods Rx: Fourteen Foods Proven to Change Your Life." Since high blood pressure is a risk factor for the decline in cognitive abilities and stroke, a lower blood pressure promotes brain health. Half an avocado contains 345 mg of potassium. The adequate intake for potassium is 4,700 mg per day for both men and women. Coagulation is the process of blood clot formation and vitamin K is essential for proper blood clotting. But it's also involved in the hardening of blood vessels. Insufficient dietary vitamin K may increase the risk of hardening, thereby increasing the risk of stroke. Half of an avocado contains 14 micrograms of vitamin K. The adequate intake is 120 micrograms for males and 90 micrograms for females. Folate is essential for brain health and the maintenance of cognitive function, including memory. Deficiency may lead to cognitive decline and Alzheimer’s disease. According to Oregon State University Linus Pauling Institute, some research has suggested that folate may reduce the risk of stroke, but research is mixed. Half an avocado contains 61 micrograms of folate. The recommended dietary allowance is 400 micrograms for both men and women. Brain and Memory Foundation: You Need Brain Food!